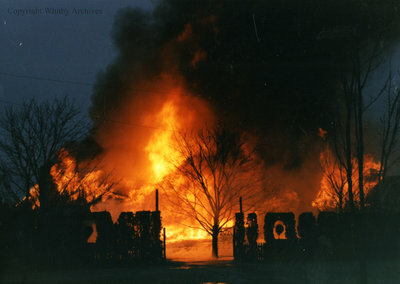 A colour photograph of the fire that destroyed the Village Restaurant and Gift Shop at Cullen Gardens and Miniature Village on February 2, 1989. View is of the front entrance. Cullen Gardens Village Restaurant and Gift Shop Fire, February 2, 1989, Photographer Unknown. Whitby Archives A2013_042_102.